Hey, I really love your submachine games, I think they’re the best point and click games on the internet and I can’t wait for the sixth one. 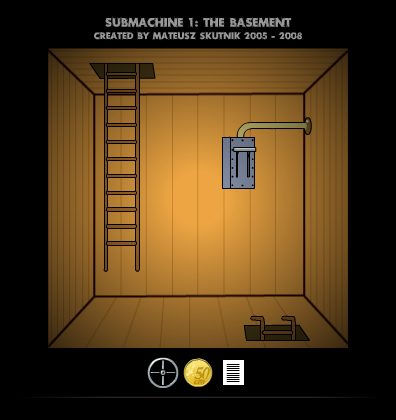 My only problem is that I have seen at least two versions, maybe three, of the original Submachine. It’s sorta confusing which one is the original and which one is that latest. I appreciate some of the changes you made to it but I think it would be good if you posted a Sub1 change log, the clarify things a little. Also known as the original, or the short version. 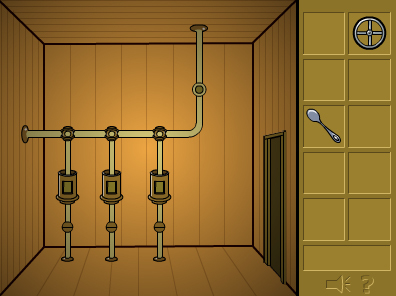 This version had… 9 rooms. Which is about 1/16 of Submachine6. But those were the early days and who could predict that this series would grow to such extent as we see nowadays. As I checked this version I was really surprized that it was so small, yet there were so many things to do in such space. We can see an inventory on the right side, with static icons of found items. You had to drag them onto stage for some kind of interaction. What a drag. :D.
Also known as the extended or the official-plot-version. Overwhelmed with the surprizing success of the first submachine I thought: I can do better than this! So I created this extended version. This extention summarized in adding one more puzzle, a whooping number of total 20 rooms and most importantly – the introduction of the wisdom crystal (gem) in the series. Those crystals played their role in following episodes and I’m pretty sure we’re not through with them. I also introduced another new thing in the series: a Dead End. You could actually find yourself in point of no return, or, to be more precise – point of no progress. You could always return, restart and try again. There’s even a restart button in the inventory, look above, there was no such thing in the first version. I know, that was a stupid idea and I never repeated that mistake. Not only in other episodes that followed, I also removed that from following versions of the basement. Also known as the unknown version or version that no one actually played. This is the extended version rebuilt around a new engine (no, not Float yet). This version skipped the flawed inventory of Submachine 2, and went straight to the no-visible-inventory mode of Submachine 4 and 5. 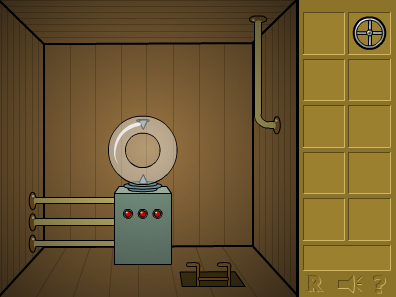 Items found just happen to appear on the right side of the screen, so when you have none of them the game presents itself in a nice graphical form of a room surrounded by black thick outline. That sophisticated graphical design went down the drain once you found your first object in the game, but what the hell. It looked nice for a second, goddamit. Fun fact: I’m not even sure why I made that version. That’s a mystery. 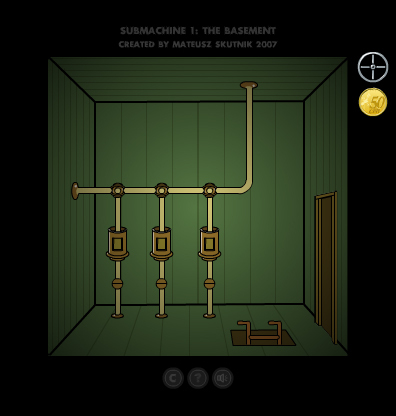 I probably thought that the engine of Submachine 4 was freaking awesome or something. Also known as the last or the current version. I don’t intend to create anymore versions of this game. I’m through with that. For now. But who knows. Maybe I’ll come up with something better than the Float someday. Oh yes, that’s the version built on the Float Engine, finally. And that’s the main reason why it’s the last version. But still – 20 rooms… What was I thinking. If I’d now come up with a new submachine episode that would consist of 20 rooms I’d be laughed off stage, or slaughtered by those craving more and more (as in: too short,too simple, make it bigger and harder lol !!!11!!eleven). Fun fact: As this version is considered to be most advanced in terms of action script programming, it doesn’t have any option to turn the music on or off. All previous versions had that. This one doesn’t. Go figure. Luckily for us this is the end of the log. why did you initially decide in the second version to introduce two doors and later removed that?